When institutions are strong, citizens demand rights; when institutions are weak, citizens beg for favors. In many countries today, governments are designed not to govern but to serve the personal enrichment of ruling elites. Under such kleptocratic systems those in power do not exercise the functions of state but concentrate instead on extracting resources for personal gain. For such regimes, governing is just a front activity. Kleptocracy is a major factor fuelling instability across North Africa and the Middle East, and is a major cause of the rise of Islamic extremism across the region. 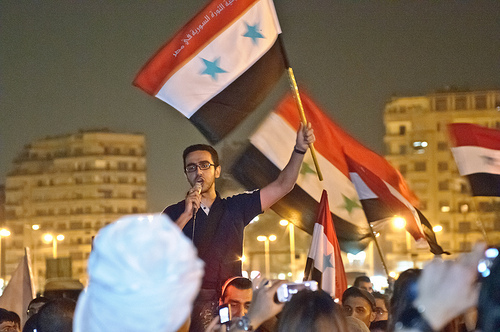 Every government that faced significant mass protests during the 2011 Arab Spring, from Tunisia, to Egypt, Syria, Bahrain, and Yemen, perpetrated acute corruption on behalf of narrow cliques that included top government officials and their close relatives. The overthrow of such long standing dictatorships was the primary aim of the millions of protestors who took to the streets during the uprisings. The immolation of fruit seller Mohamed Bouazizi in Tunisia acted as the trigger. Within months, four of the region’s most entrenched dictators – Zine El Abidine Ben-Ali in Tunisia, Hosni Mubarak in Egypt, Muammar Gaddafi in Libya, and Ali Abdullah Saleh in Yemen – had been forced from power. In Bahrain widespread peaceful protests were suppressed by the authorities with the help of Saudi Arabia, while in Syria a bloody civil war erupted in response to Bashar al-Assad’s brutal crackdown on peaceful protests there. The region’s kleptocracies were decades in the making. Following independence, the Arab states developed similar autocratic systems of government, comprising a President for life backed the army, police and other internal security organisations. During the 1990s in particular, the nature of the regimes changed as globalisation provided enormous opportunities for the ruling elites to enrich themselves through the privatisation of state companies and the attraction of foreign capital. This placed vast wealth in the hands of the presidents, their families and a small number of oligarchs close to the president. For decades leading up to the Arab Spring the region’s authoritarian rulers successfully applied a formula for survival based on a combination of surveillance, control and fear, tempered by the occasional election to create the appearance of reform. The United States and its allies also played a role in maintaining the region’s dictators in power for so long. In country after country across the region a similar pattern emerged. Ruling families amassed enormous wealth while economies faltered. State oppression in the form of arbitrary arrest and torture were widely used to suppress dissent. Widespread corruption, particularly by the police, meant that harassment became an everyday occurrence. The apparent permanence of this state of affairs, at a time when there was an enormous bulge in the young population, engendered feelings of hopelessness allied with a longing for change. Tunisia was the first country in which that change occurred. During Tunisian dictator Ben Ali’s reign, he deliberately and systematically restructured the economy in order to direct a large proportion of the profits from the country’s private sector into the hands of him and his family. An analysis by the World Bank in 2014 showed that 220 companies controlled by Ben Ali, his wife Leila Trabelsi and their children and siblings, received one fifth of the total profits from Tunisia’s private sector. Companies in telecommunications, media and construction were particularly lucrative. As well as taking ownership of key companies, Ben Ali also used the legislative power of the state to kill off any companies that could act as competitors to those in which he and his family had a stake. One example of how this worked was the treatment of a non-profit private school, a competitor to the International School of Carthage which was founded by Ben Ali’s wife, Leila Trabelsi. The rival school was temporarily closed due to alleged failure to comply with regulations, was prevented from teaching some subjects, and was eventually prohibited from awarding diplomas. The school’s taxes were then raised and new regulations about classroom size were imposed, all to reduce the school’s effectiveness and maximise the profits from Trabelsi’s school. So it was with any business that threatened to interfere with the flow of profits from Ben Ali’s private economy. Tunisia’s banking system also played a crucial role in enriching the ruling family, acting as an almost unlimited source of private funds. Banks routinely provided the family with loans they were never expected to repay, and wrote off lists of unpaid loans every year. Such privileged treatment enabled the family to reap rich rewards, particularly in the construction sector where rising property prices meant that massive profits could be accrued by anyone with access to finance. During his time in power the Ben Ali clan is estimated to have accumulated in the region of 11 billion dollars. The lavish lifestyles of the Ben Ali clan heightened the frustration of the Tunisian public and was a major force behind the uprising that sparked the Arab Spring. Tunisian’s experience of the everyday reality of police shakedowns and brutality meant that when Mohamed Bouazizi committed his desperate act, the act of a poor fruit seller who did not have the money to bribe the police who were harassing him, the populations’ fury was enough to sweep Ben Ali’s kleptocracy from power and provide the spark for the Arab Spring. The same story of everyday poverty for millions, contrasted with displays of lavish wealth by the ruling elite was familiar to Egyptians. So too was the everyday reality of police corruption and brutality. More than twenty two million Egyptians live on around $2 a day. Almost one third of Egyptian children under the age of five are stunted due to malnutrition. Beginning in the late 1990s, a group centred on Hosni Mubarak’s son Gamal began to take control of Egyptian state institutions, rewrite laws, give themselves privileged access to land and other public resources, and employ police repression, all for private gain. As in Tunisia, the lavish displays of wealth by Gamal’s clique played a major role in fomenting the revolution. And as in Tunisia, Egypt’s police regularly arrest people without reason, plant evidence on innocent arrestees and concoct charges to make money on bribes. When the revolution broke out, one of the rallying cries at the protests in Tahrir Square and around the country was ‘We Are All Khaled Siad’, highlighting the beating to death by police of Khaled Said outside an internet café in Alexandria. The examples of Tunisia and Egypt were the rule rather than the exception. In the Arab Spring, the populations of the Arab kleptocracies sought to replace the unbridled corruption of self-serving dictators with the checks and balances of electoral democracy. They hoped to replace police corruption with the rule of law. The response of some of the region’s entrenched dictators, particularly in Libya and Syria, however, showed the lengths to which the region’s rulers were prepared to go to hold onto power. Subsequent developments, such as the wars in Syria and Libya and oppression in Egypt and elsewhere, have crushed the hopes of millions and helped swell the numbers of those seeking to bring about change through violent means. This entry was posted in Dangerous Personalities Today and tagged Arab Spring, Ben Ali, corruption, Egypt, Islamic extremism, kleptocracy, Tunisia by Ian | disorderedworld. Bookmark the permalink. This pattern, as you rightly observe, continues with oppressive dictatorships in Yemen, Egypt and Bahrain supported by US, Israeli and Saudi money and military “aid”. Another point worth making is these countries have also been infiltrated by CIA, MI6 and Mossad forces that work to destroy democratic hopes of the people. Ukraine is one more example of Western interests undermining and overthrowing a democratically elected government to support US/NATO and European banking interests. This is aggression of the worse kind and makes the world more dangerous and dysfunctional. Hi Doug. Thanks for your comments. I’m writing a piece at the moment about the relationship between poverty and the rule of law. It’s based on my argument that the pillars of liberal democracy – elections, human rights and the rule of law – are all defences against people with dangerous personality disorders. I think poverty makes a fair and effective system of law problematic. When poverty is widespread the state does not have the resources for effective law enforcement. In places with gross differences between rich and poor, the rich can pay to avoid having to face the consequences of breaking the law. And of course kleptocracy creates poverty by distorting the economy for the benefit of the few rather than the development of a properly functioning economy and society. If you have any thoughts on these issues I would love to hear them.